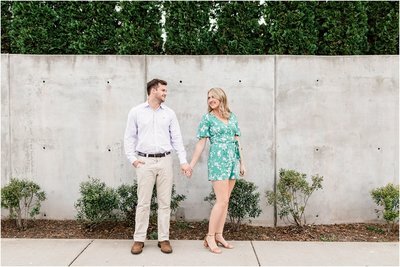 I met up with Shaunna and Jarron in Franklin, Tennessee on one of the most beautiful days in June. We had originally had scheduled for the week before, but the rainy weather forced us to move it and boy, was I glad. We had low humidity in a month know for humidity in June! The pair were both naturals in front of the camera. We weaved throughout downtown’s Main Street, stopping in some of my favorite spots to shoot and finding a few new places along the way. After making it back to our starting spot, we decided to take a short drive to Arrington Vineyards to shoot on their beautiful property. Shaunna and Jarron are recent residents of Tennessee, coming from California, so the vineyard was a special place for them. We timed things so perfectly to be among the grape vines for a beautiful sunset!